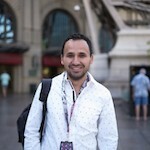 Salvador Mendoza is a security researcher focusing in tokenization processes, mag-stripe information and embedded prototypes. He has presented on tokenization flaws and payment methods at Black Hat USA, DEF CON 24/25, DerbyCon, Ekoparty, BugCON, Troopers and 8.8. Salvador designed different tools to pentest mag-stripe and tokenization processes. In his designed toolset includes MagSpoofPI, JamSpay, TokenGet, SamyKam, BlueSpoof and lately NFCopy.